In life, certain knowledge is crucial, from the exact fare for a bus ride, to exactly how fast that bus must be traveling in order to jump an impending 50-foot freeway gap because A MADMAN HAS TAKEN CONTROL OF THE BUS! 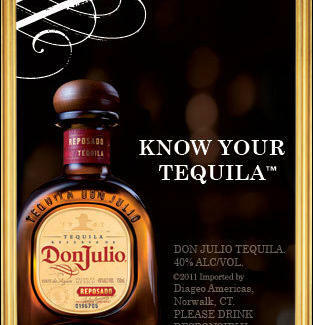 Of course, the most crucial knowledge of all is tequila -- and to know tequila, you must know Don Julio. Don Julio is the world's first ultra-premium tequila, founded in 1942 by Don Julio González, a visionary who spent 40 years perfecting his eponymous spirit, right down to the squat bottle that allows for dinner guests to talk over the glass instead of through it. Almost 70 years later, Don Julio is made from fresh agave hand-picked on Don Julio's private estate, because human expertise creates the best product, and because machine harvesters might become sentient, then revolt, then deny humanity the very thing that makes life worth living: extraordinary tequila. An impressive and delicious force on its own, Don Julio also shines as the essential ingredient in a Blanco Mojito or Blanco Fresh Agave Margarita, two of the fiercest blancos this side of the great blanco shark -- for recipes to both, click here. Score more drink recipes, plus history and notes on the artisan production process, at DonJulio.com -- and don't worry about exact change, because this is one spirit that'll always stay the same. DON JULIO Tequila. 40% Alc/Vol. ©2011 Imported by Diageo Americas, Norwalk, CT. Please Drink Responsibly.